There is water on the moon! As we’ve outlined before, it’s somewhat tricky to keep water on the surface of the moon, because the combination of heat and particles from the Sun, a lack of an atmosphere, and no magnetic field means that it’s pretty hard to keep water that’s exposed to sunlight from evaporating away into space. What that means is that if you want to have water persist anywhere on the Moon, it has to be sheltered from the Sun somehow. An easy way for this to happen is at the poles, where some craters are deep enough that the Sun’s rays never reach into the bottom of the crater. Places like this are called “cold traps”, because it can trap material in a solid form that would otherwise escape if it weren’t so cold. Near the south pole of the Moon in particular, we found frost in some of these deep dark places. This frost makes the surface more reflective than it would be if there were only rock sitting around in those craters - so the coldest places also wind up being more reflective if you’re bouncing light off of ice. This particular study is careful to note that we’re not seeing frozen pond-style pools of water, but more like the frost that builds on the outer edges of leaves in fall. 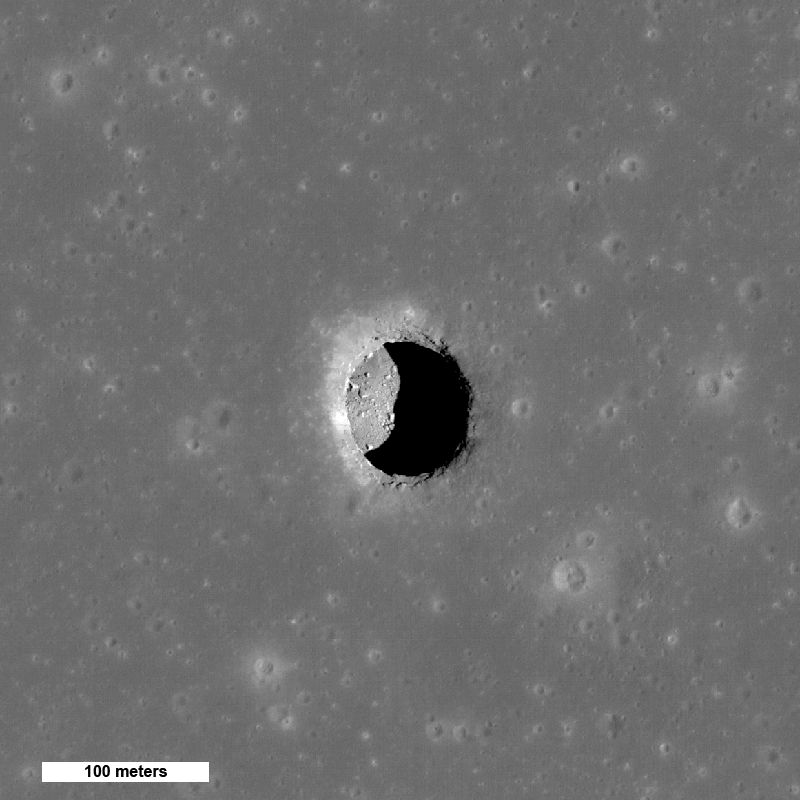 But craters aren’t the only places that water ice could hide - we have a sneaking suspicion that the Moon also has tunnels woven under its surface. The Moon had a surprisingly long era of volcanic activity in its younger years, and where there are lava flows, you can wind up with lava tunnels. We are pretty sure that the moon has these. We see them most easily as they collapse, because then you get a snake-like pattern of collapsed ground, twisting its way across the surface as a series of giant potholes. Every so often, there’s a more isolated cave-in, giving us a glimpse into a sublunar cavern - a deep shadow cast into the depths catches the eye and the imagination. If water had accumulated in these hidden tunnels, they would also be relatively protected from evaporation. However, it’s one thing to have a plausible place for water, and another to find it for sure in those places. Lava tunnels are an extremely appealing place for water, though - because they’re also an appealing place to put a human base on the Moon. While we don’t have to worry about humans evaporating, any shelter from intense heat and cold helps us as well. So if there were also water down there, they’d be a great place to put an inhabited base. You can definitely also wind up with watery molecules bound up in the rocks themselves. A recent study suggests that instead of having lots of water ice hanging around, the Moon may have a lot of hydroxyl, which is one hydrogen and one oxygen bound to each other, rather than the two hydrogens and one oxygen that make up your standard water molecule. Hydroxyl binds easily to other things, so it can wind up binding itself to minerals in the earth - you can extract it and create water, but it’s more energy intensive than just having water lying around. So the true answer is that there’s going to be a mixture of places where water will be found - on the surface in sheltered places, possibly in underground tunnels, and some not-quite water bound up in minerals! How Do Black Holes Get Started? It depends on how big the black hole is! If you’re dealing with a small black hole, then we have a pretty good understanding of how the black hole forms. The smallest astrophysical black holes are objects that form during the catastrophic explosions of dying, large stars. These stars contain so much mass that when they begin to explode in a supernova, the shock wave of the explosion can ricochet down into the core of the star, compressing it down to the point that the object in the center of the star becomes too dense for electrons to hold atoms apart (the end point for a white dwarf), further down until the star becomes too dense for neutrons to hold each other apart (the end point for a neutron star) and after that point, the object becomes so dense that even light can’t escape it. At that point, it seems logical to assume that the object itself will continue to press itself inwards, subject to its own ever-increasing gravity, until it takes up no more space than an infinitely tiny point - a singularity. 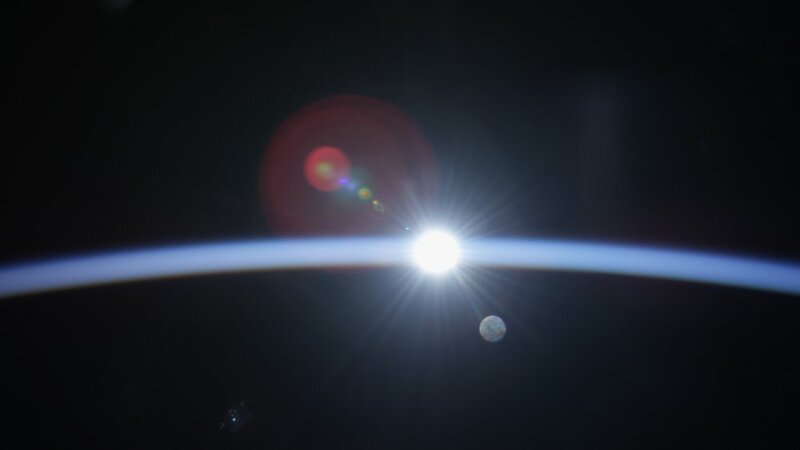 Left behind, far outwards, is the contour in space which marks the threshold of no return for light - if light travels closer than this horizon, it’s not coming back. This spherical contour surrounding the black hole is known as the event horizon, and often this whole region of space is called the black hole, as it’s a region where the existence of the black hole is the most important thing around. The black holes formed this way are a few times larger than our own Sun, made out of stars at least eight times larger than our own Sun. When you want to create black holes which are larger than that, like the supermassive black holes at the centers of galaxies, the situation has to be slightly different. These black holes are many, many times larger than our own Sun - millions to billions of times more massive than the black holes which form from individual stars. How did they form? If we want black holes to grow to this size, we’re going to have to give them a lot of time. Fundamentally, though, we still need to take a lot of mass, and compress it somehow down to a sufficiently high density that it will continue to collapse down into a black hole. This is a tricky thing to do, because matter tends to resist collapse, so you need to have quite a bit of force involved. There are a few possibilities, though. One is to scale up the mechanism that we know works for smaller black holes, and start with a larger star. On the scale of a supermassive black hole, this pathway is still starting pretty small. We even have the advantage of starting with the stars in the very earliest Universe, which are thought to likely be hundreds of times more massive than the stars we see near us now. When those larger stars explode, they should leave behind a black hole, which, while larger than the black holes we typically see from stellar explosions nowadays, would still need to grow considerably to reach the size of a supermassive black hole. You’d have to do some combination of feeding that black hole a lot of gas, or merging it with other black holes. But black holes are terrible at gathering gas efficiently into itself in order to grow in mass, and the mergers between black holes are also thought to take quite a long time, though they do happen if you leave them long enough. Another option is to start large. How do you do that? Well, you could possibly build a tremendously large star, and let it collapse at the end of its life. 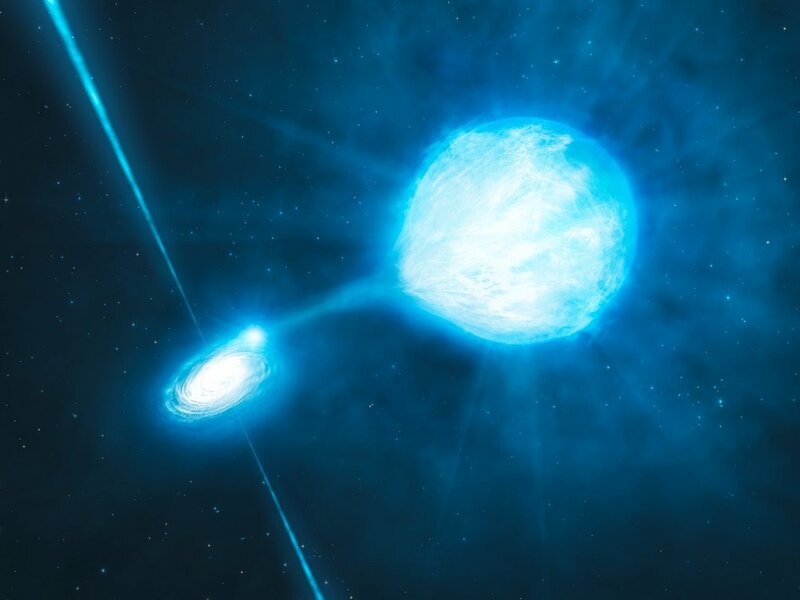 This collapsing star would have to be tens of thousands times larger than our own Sun (and considerably larger than your standard early-universe star), but that would allow for a black hole many thousands of times more massive than our Sun to form when the star inevitably explodes at the end of its short lifetime. From that larger starting point, you would still need to grow a lot, over time, but if you start large you’d need less building. Going from 10,000 times larger than the Sun to the 1,000,000 times larger than the sun is much, much easier than going from 100 times larger than the Sun to 1,000,000 times larger than the Sun. These large black holes are probably built through a combination of these possibilities, and potentially some other possibilities we haven’t yet constructed. These questions are part of why we built LIGO, and have plans to build an even more sensitive machine in LISA - those devices will allow us to figure out how common it is for black holes to merge together, and that can help us figure out what the population of black holes looks like in the first place. After all, LIGO has been full of surprises already! Looking Into Space, When Do We Start Looking Into The Past? It depends very much on how far away you’re looking! Most things out there could be considered “a far away distance”, even when we’re dealing with objects within our own solar system, but the times involved to travel between Mars and the Earth are much closer to nearly real-time than they are if you start venturing further afield. Fundamentally, information can only travel through the Universe at the speed of light, and the larger your distances get, the longer it takes light to cross those distances. For anything happening on the Earth, this is not usually much of an impediment, because the distances involved in circling the Earth are not so great. To get from the surface of the Earth to the ISS (a distance of 408,000 meters), light, which travels at 299,792,458 meters every second, is only going to spend about a thousandth of a second (0.0013 seconds) in transit. Events on the ISS can therefore be considered pretty much real time, even though there is a measurable communications lag. If you go further afield, but still within our solar system, light takes about 1.25 seconds to get to the Moon (so a two and a half second round trip), eight minutes to get from the Sun to the Earth, or about twelve and a half minutes to get to Mars. This all starts to build up to a more considerable time delay, but these are manageable delays - if I got an email response from someone I was writing to in less than 24 minutes I’d think that was pretty rapid. Once you try talking to the outer solar system, the time delays get a little more significant. The light travel delay to New Horizons when it was swinging past Pluto was about four and a half hours, so to ping New Horizons and hear back instantaneously from the craft, you’d be waiting about nine hours. Somewhere around this kind of time delay, we might start to classify things as happening “in the past”, but this is still a time delay on functional human timescales. Nine hour delays are sending an email to someone and hearing back in the morning. Not so convenient, especially if something complicated is happening in that time, but also not the worst. It’s when we start looking beyond our solar system and into the Milky Way as a whole, or towards other galaxies that the time delay, which has just been scaling up with the distances involved, gets a little more outrageous. To get information from the center of our own galaxy out to Earth, you have to wait over 26 thousand years. That is no longer a length of time I can wait for an email reply. Information that reaches the Earth from the center of our galaxy is as up to date as it can be, but it’s reporting on changes that happened 26,000 years prior. The changes we see, therefore, are happening at whatever speed we see them happening, but with a time-lag. If we teleported there, it’d be old news. You can imagine that the further out we go, the bigger this problem gets. So, scrolling outwards, the next big thing is Andromeda, which is so far from us that light has been stretching towards us from those stars for 2.5 million years. I think by most standards, this would be considered observing the past, and yet it’s the closest (and therefore informationally least out of date) galaxy we can look at! Most of the rest of the galaxies in the Universe are much further away, and therefore any changes that happen within them are going to be reported to us by our cosmic messenger in light many millions or billions of years later. The one above is 100 times further away than Andromeda, so news from that galaxy will take 100 times longer to reach us. Where exactly you feel you should put the boundary between “pretty close to real-time” and “definitely looking at the past” is a bit of an arbitrary, fuzzy boundary. If you want to use “how long would you wait for an email reply” as your metric (as I have here), then your boundary is somewhere within the confines of the solar system. But no matter what you want to put down, there comes a point where we are definitely looking into the past, and certainly by the time we’re looking at other galaxies, we’ve reached it. Sign up for the mailing list for updates & news straight to your inbox! Astroquizzical is becoming a book! Check here for details & where to preorder. What Do We Encounter Going Straight Up Out Of The Solar System? The solar system is indeed pretty much a flat sheet, with the major planets all orbiting in a very thin plane surrounding the Sun. Part of the reason we don’t tend to send spacecraft in the 'up' direction, out of this thin plane, is simply that there’s not very much there! Now, that’s not to say that there isn’t anything out that direction, but you have to travel for a while before you reach it. Closest to the solar system, but at its outermost fringes, the orbits of the objects in the Kuiper Belt deviate from this extremely flat plane, but still tend to orbit mostly in a disk surrounding the Sun. Instead of an extremely flat plane, you have something more like an inner tube - inflated, with some vertical height to it, but still mostly lining up along the plane of the rest of the major planets. This area is where Pluto falls - its orbit is tilted out of the plane of the major planets by 17 degrees, but it’s not so far tilted out of the plane of the rest of the planets that it’s really traveling overhead the other planets. What you do get overhead the planets is a much more distant object, the Oort Cloud. This is a reservoir of comets, incredibly distant from the Sun, which are arranged in a roughly spherical distribution around the Sun. The objects out here are small, dimly lit chunks of ice and rock, and so far from the Sun that they are extremely difficult to observe, even with high end telescopes. If we travel further away, and look for even more distant objects, then suddenly we run into a proliferation of stars within our own galaxy which are 'up' above the plane of our solar system. Part of this is that the galaxy is much thicker than the solar system, and so even if the plane of the galaxy and the plane of the solar system were perfectly aligned, we would see stellar neighbors of our Sun, both above and below our solar system. However, our solar system isn’t perfectly well aligned with the Milky Way galaxy- those two are off from each other by 63 degrees. What this means is that we see far more stars 'up' or 'down' out of our solar system, as we look through part of the densely populated disk of the galaxy, than we would if we were looking directly 'up' out of the plane of the galaxy. 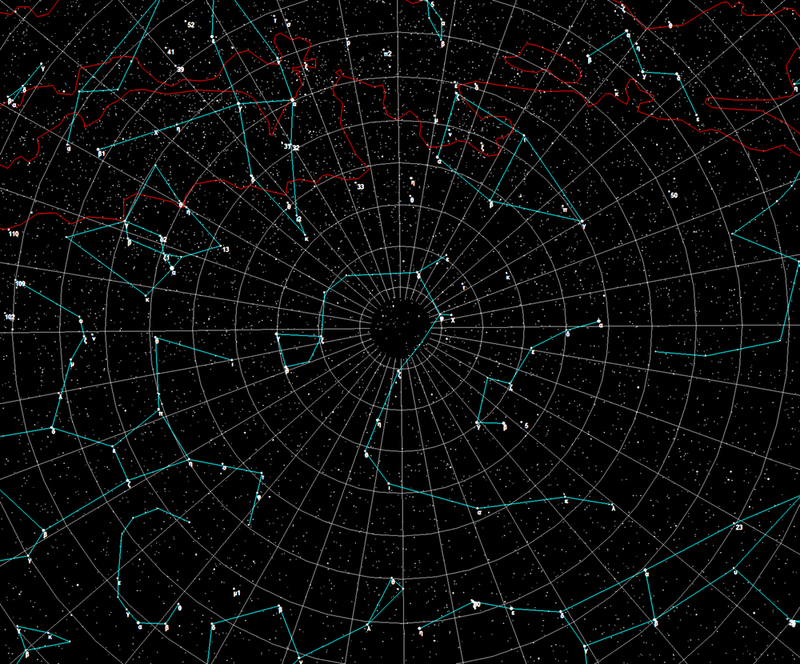 The constellations are a good example of things that exist 'above' our solar system. Our planet spins on an axis that’s tilted by 23 degrees relative to the plane of the solar system, so looking at the stars at the exact North Pole isn’t quite pointing us in the right direction, but it’s pretty close! If you find the North Star, Polaris, and then wander about twenty degrees (about two fists, held at arm’s length at the sky) away from the path the Moon travels, now you’re pointing 'up' out of the solar system. The constellations in this region of the sky are plentiful. This is roughly where the cup of the Little Dipper is, though exactly 'up' is in the much fainter constellation Draco (illustrated at the top of the article). The stars that hang 'above' our planet remain roughly stationary in our night skies as our planet rotates beneath them - if you’re far enough North these stars will never set. Since the direction of 'up' away from the solar system doesn’t also point you directly out of the Galaxy, if you want to face a direction that aims you at the center of the galaxy or 'up' out of the Galaxy, you need to point yourself in a different direction. The center of the galaxy is in the direction of the Sagittarius constellation, which looks a bit like a very pointy teapot in the sky. To point your face out of the galaxy, you must aim yourself at the lesser-known constellation Coma Berenices, which is surrounded by other constellations you’ve probably heard of - Virgo and Leo border it, as does Ursa Major (which contains the Big Dipper). If you take the last three stars in the curve of the handle of the Big Dipper, and imagine them creating a long, pointy pizza wedge, you’ve gotten pretty close to Coma Berenices. What's in that direction? Not much that's visible to the naked eye, but if you have a well-equipped telescope, you run into the Coma Cluster, a very dense collection of galaxies - an environment very unlike the galaxy our own Milky Way finds itself within.